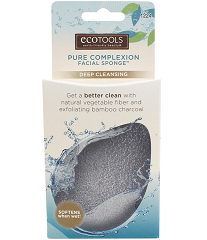 EcoTools Pure Complexion Facial Sponge Set Giveaway – 5 Winners! Fine Print: I was given a set of EcoTools Pure Complexion Facial Sponges for review and EcoTools is giving more to readers. All opinions and statements below are my own. I have never been particularly good about washing my face, but it’s a regimen that I know I have to get better at. I usually wash my face quickly with water at night and a few times per week I’ll do a quick exfoliating scrub. It’s not a fantastic amount of care, but it’s something! So when EcoTools asked if I’d like to try out their new 100% natural konjac sponge, I thought that maybe it would help me with my routing! Konjac is a root-based vegetable from Asia that is known as a detoxifying ingredient and used by women for gentle face exfoliation and a deep clean. The 100% natural konjac sponge is making its way overseas and EcoTools is one of the first brands to bring it to the masses with the Pure Complexion Facial Sponge. Deep Cleansing (exfoliating bamboo charcoal removes old skin cells impurities and leaves skin glowing) and Sensitive Skin (safe for even the most sensitive skin) are available. It was recommended that I use the sponge twice per day, but I’ll be honest, that only happened a few times. I used it every night on-and-off with my exfoliating scrub (one night with just water, the next with the scrub, etc). I also tried both the Sensitive Skin and the Deep Cleansing at different times. There are a few things to note with these sponges. First, they start out HARD. Like, hard, hard sponge hard. When you run the water over them for about 10 seconds and squeeze it through, they become very soft, smooth sponges. My kids thought that was AWESOME. The sponges are both shaped in what my kids have now described as the “avocado rock” and I can’t think of anything else! That is what they are – in the shape of an avocado, but they look like rock – especially when dry. You should also note that once the sponges dry after use, they become extremely hard again. They also seemed to shrink a bit, but the cleansing properties remained the same. How did they work, you ask? Pretty well! You can definitely tell a difference between the two varieties (the Deep Cleansing is a bit more rough on the skin, as you would expect), but I feel like they both did the job. After the first two days I wasn’t sure anything was happening, but after about the fifth day, I noticed a difference in my skin. Even when rinsing with water, my face felt smooth and clean – no extraneous dead skin. Additionally, I haven’t broken out or seen any skin irritation with either. Hopefully you’ll find the same thing! To get everyone more interested in their facial care, I am giving five lucky winners a set of EcoTools Pure Complexion Facial Sponges! To enter this giveaway, complete any or all of the options listed below. Giveaway ends 8/26. Good luck! I think I’d do like you did & alternate between the deep cleaning & regular- I am horrible at washing at night, need to get into a better routine! Is like to try the deep cleansing one. I would like to try the deep cleansing sponge. I like the idea of alternating like you did. I think that would be the best for me. They both sound great! I have sensitive skin but would also love the deep cleansing. Thanks for the post and giveaway! I would love to try the Sensitive Skin sponge – thanks!! I would love to try the deep cleansing sponge (even though I have sensitive skin). I think the Deep Cleansing sponge would work best for me. One for Sensitive Skin for me. I would need the deep cleansing. I’d like to try the deep cleansing sponge on my sensitive skin. I think the Deep Cleansing, Pure Complexion Facial Sponge would work best for me. I think the deep cleansing would work well for me. I tend to break out over everything, so the sensitive skin would be awesome too. The Deep Cleansing would be best for my skin as I have flaky skin. I think the deep cleansing one would work for me. I think the Sensitive Skin sponge would be best for my skin. The Deep Cleansing sponge would work best for me. I think I’d like the Sensitive Skin sponge best. I think the sensitive skin sponge would work best for me.